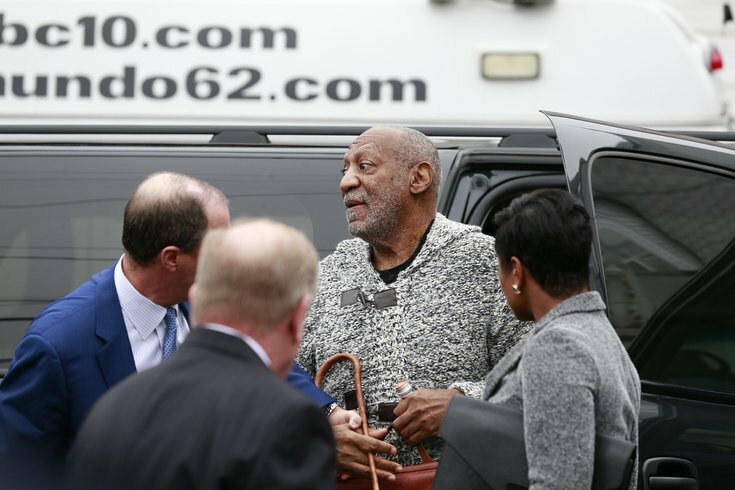 In this file photo, Bill Cosby is arraigned at Montgomery County District Court in Cheltenham, Pa., on Wednesday, Dec. 30, 2015. The presiding judge in comedian Bill Cosby's sexual assault case may have concealed a grudge against former Montgomery County District Attorney Bruce Castor, a key witness in the case, over a secret relationship he allegedly had with a young attorney nearly 20 years ago, according to a report. Judge Steven T. O'Neill, who declared a mistrial in the case last June, may have opposed Castor's testimony because of a political feud dating back to their battle as GOP candidates in the 1999 race for Montgomery County District Attorney, unnamed sources told gossip site RadarOnline. According to the report, O'Neill had a close relationship with then-attorney Maureen Coggins, who was serving as an assistant district attorney under Castor in 1998 and 1999. Coggins is now a judge for the Montgomery County Magisterial Court in Pennsylvania. At a party event designed to give Castor and O'Neill a chance to pitch their candidacy to local Republicans, Coggins was seated directly in front of the podium wearing a "Castor for D.A." pin, the site reported. O'Neill bombed his presentation, the sources said. Cosby's case centers on allegations that he drugged and sexually assaulted former Temple University employee Andrea Constand at his Cheltenham home in 2004. The two settled in civil court, but Castor declined to bring criminal charges against the entertainer in part because of questions about Constand's delay in reporting the alleged incident to police. He also doubted whether evidence in the case was reliable and admissible. Prior to the trial last June, O'Neill openly questioned Castor's oral non-prosecution agreement with Cosby's lawyer in 2005. He wondered whether Castor remained relevant to the case at all, but the former D.A. eventually took the stand and defended his decision not to prosecute Cosby. Sources told RadarOnline they believe O'Neill's attempts to block Castor stem from an alleged grudge over the humiliation he experienced in 1999. Castor sued both Constand and her attorneys last November, claiming they engaged in a "smear" campaign against him in the 2015 race for Montgomery County District Attorney. Castor ultimately lost to Kevin Steele, who has backed O'Neill in questioning Castor's relevance to the present case. Cosby's defense team, now led by former Michael Jackson attorney Tom Mesereau, is reportedly expected to ask O'Neill to recuse himself from the case for failing to disclose a potential conflict of interest, as required by law. O'Neill never referenced the alleged 1999 incident before the first trial, but sources told RadarOnline Castor is willing to attest to the grudge if questioned about it. The former D.A. denied that he had anything to do with where Coggins was seated the night of the event. As pre-trial hearings for the high profile case continued this week, O'Neill gave prosecutors a victory by permitting the testimony of five additional women, including model Janice Dickinson, who have accused Bill Cosby of sexual assault. Jury selections were set to begin April 2 and O'Neill still remains tasked with deciding whether or not Castor can testify at the retrial. The defense team for Cosby, 80, called the report "very disturbing" and claimed O'Neill's history jeopardizes the comedian's chance of receiving a fair trial.